Chemiluminescence is a non-radioactive, chemical reaction which produces a white light. 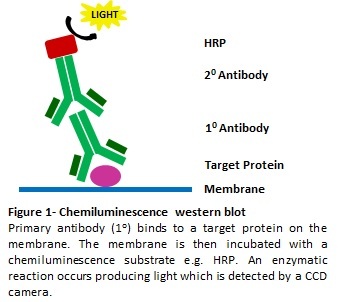 In chemiluminescent western blotting, chemiluminescence occurs when a chemiluminescent substrate attached to an antibody bound to your target protein undergoes an enzyme-based reaction. Chemiluminescence is more sensitive than colorimetric protein detection because the antibody targets your protein specifically and the enzyme amplifies the light signal. Methods commonly used to produce chemiluminescence include ECL, where HRP (Horse Radish Peroxidase) oxidises luminol or CDP-Star®, where a 1, 2-dioxetane compound is dephosphorylated by alkaline phosphatase. To visualise the resulting bands, you can use X-ray films, which can be time-consuming and expensive or cooled CCD-based systems to generate digital images. Since chemiluminescent molecules produce so many photons of light, with the right types of image capture technology, you can use chemiluminescence to detect proteins that are expressed at low levels. Since chemiluminescent light is generated internally, your protein sample won’t be damaged, and you can re-use the protein. Chemiluminescent western blotting is the best technique if you need highly sensitivity detection of a single protein. 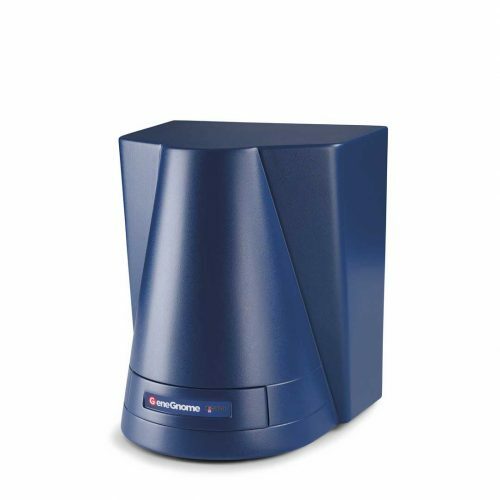 Using a dedicated chemiluminescence CCD-based system, like the GeneGnome XRQ for imaging your chemiluminescent Western blots, gives you wider dynamic range than film, allowing you to safely and accurately detect and analyse picogram and even femtogram levels of protein. 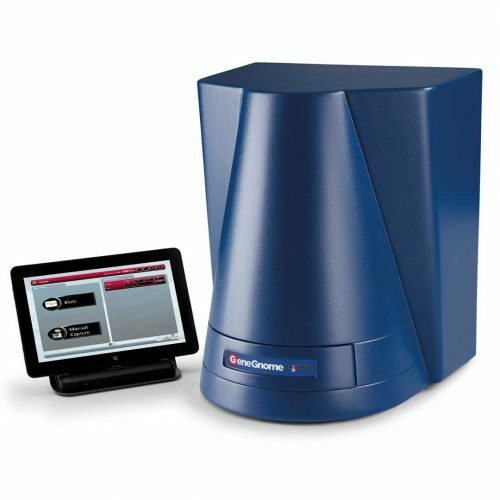 With the GeneGnome XRQ system’s powerful GeneSys software you simply select the chemiluminescent substrate you are using, the system then automatically captures your choice of one or a series of images, ensuring you’ll effortless produce a perfectly exposed image, without using any film. If you’re looking for a system, which can image chemiluminescent and fluorescent western blots, the G:BOX Chemi or G:BOX mini systems are a perfect choice.